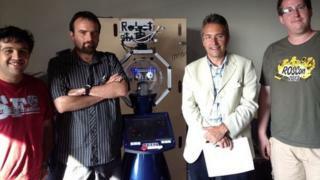 Researchers are developing software for robot "brains" so they can be used as security guards and care assistants. The £7.2 million robot project, led by a University of Birmingham academic, involves developing mobile robots that can learn from their experiences. The University of Lincoln has been awarded £750,000 to help develop the software to process the experiences. Security company G4S Technology and the Academy of Ageing Research, an Austrian care home provider, are both involved. The robots will be tested in a care home, and a security environment run by G4S. Prof Tom Duckett, from the University of Lincoln, said there were many potential uses for the technology. "While we've chosen a care facility and a security scenario as two possible applications, the technology is really much more general purpose than that," he said. "[It] ultimately should lead to the coming generation of robots which will be able to share our living spaces and work spaces, and be our co-workers and, who knows, maybe even our friends." The four-year Strands project is funded by the European Union's Seventh Framework Programme, which supports research and development in the EU. Dr Nick Hawes, lecturer in intelligent robotics at the University of Birmingham, is coordinating work at the eight sites taking part in the project, including universities in Austria and Germany and the Royal Institute of Technology in Sweden. Prof Duckett, who is director of the Lincoln Centre for Autonomous Systems Research, is leading the research on creating 4D maps of the environment and investigating methods for detecting changes and unusual situations. 4D mapping is like 3D mapping, but takes into account extended time periods. Prof Duckett said the work was about "augmenting" human workers rather than replacing them. "Where a security robot could be really helpful is that it could notice some really small change, some really small detail, a change in the 3D structure of the environment that a human wouldn't necessarily recognise," he said. "Then it could alert the human operators and say, 'look, I've recognised something unusual in sector three' or wherever it might be, and then the human can have a closer look." At the end of the project the research team will demonstrate their systems at science museums, public events and trade shows. Prof Duckett said: "We will see this technology come more and more into our everyday environments in the future as time progresses, I'm sure of that."